If you are a Social Media marketer, or just interesting in promoting your own business through social networking sites – then we have a great book give-away for you today. 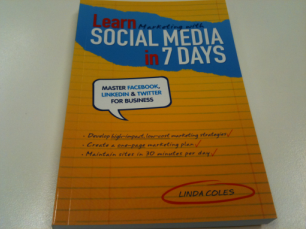 I am reading this book at the moment and it gives some great tips on how to use Facebook, Twitter and LinkedIn for business marketing. Next week I will write a review and post it up. Everyone is welcome to enter the draw for a chance to win a copy, simply enter your name, email and location in the form below (however for logistical purposes – please note this is open to people in Australia only). I will close entries at 8pm on Thursday 15/09/11. The winners will be selected at random and I will contact you late this week/ early next week by email. This book give-away has been made possible by the people at John Wiley & Sons Australia Ltd and you can see further details about the book here.